The last couple of days haven’t exactly felt like summer but I’m sure that July will give us sunny, hot weather. And in that line of thought, showering at least once a day gives us a refreshing moment that could reverse some of the consequences of the heat. That’s why a nice shower gel is always a must for me! 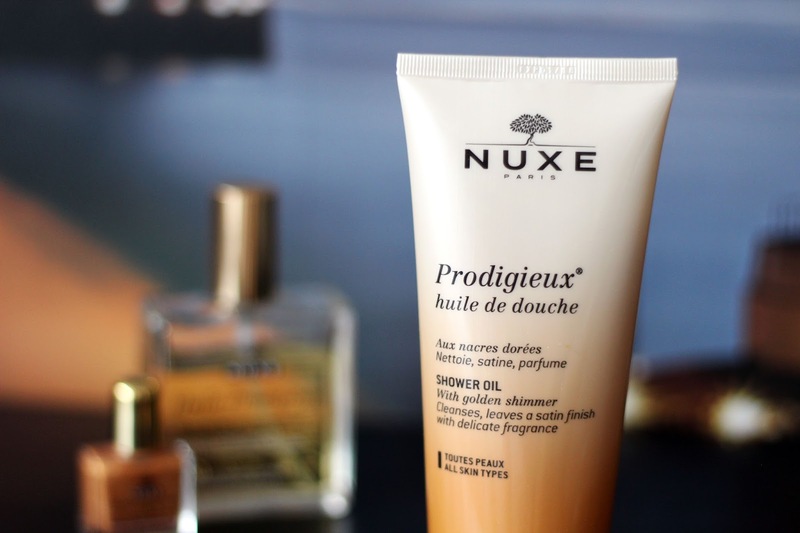 Nuxe Prodigieux huile de douche*, or as it’s described on the package – a shower oil with golden shimmer, is one of my latest favorites for the bathroom. As I have already told you, every Prodigieux product that I’ve tried smells amazing and unsurprisingly, the shower gel does as well. The texture is super soft and shimmery (! ), cleanses smoothly and softens my skin. The most important aspect of a body cleansing product for me is that it shouldn’t dry out my skin. Luckily, this product doesn’t but smooths and soothes perfectly! After the shower, it’s vital to moisturise the skin with a body lotion or oil. In the summer, especially when I go on a holiday to the seaside, my skin gets pretty dried out. Therefore, I like to use products that moisturize the skin deeply, just as Huile Prodigieuse Or Multi-purpose dry oil*. I’ve already shared with you how much I like Nuxe dry oil and now I was even more amazed to find out that there’s a version with golden shimmer. As a result, my skin is soft, moisturized and glowing! I’m totally in love with this product! All in all, both products are a heavenly ritual for my body! I haven't ever used this brand before but it sounds amazing. It is quite pricey but it sounds worth it! I like the idea of the shimmer. Does the glitter come off onto your clothes? Never use the product and its sounds great! Thanks for visiting my blog! Mind following each other? Let me know! Great stuff, the color looks divine. Amazing products! I like their logo! I purchased this dress for my matron of honor in my prom. The dress fit perfectly! The quality of the fabric was excellent! She loves it!.I was concerned about the color, because my colors are coral and ivory. I wasn't sure about the watermelon, since I hadn't seen the color of fabric…so I took a chance on it after looking at the swatch on the computer. And to my SURPRISE, the color was perfect !!! And I am a very happy bride to be. Thanks! Planning my daughter's sweet sixteen and the minute she saw this dress, she fell in loved with it. My dress arrived its a very nice dress well maid, the design is just like in the picture except the material was supposed to be . anyways I still like the dress it looks very nice on me and it fits me perfectly. Thank you .